President Obama’s executive order calling for federal agencies to build resilience against extreme weather is a fitting response on the one-year anniversary of Hurricane Sandy. Climate change knows no boundaries and as its impacts become more widespread, key efforts at all levels of government are critical to address this growing global problem. Particularly vulnerable countries like India are similarly taking action to protect its people by preparing for present and future climate-related disasters. The United States, like India, has suffered from devastating hurricanes, floods, droughts, and heat waves this past year – all of which are projected to increase due to global warming. And these natural disasters disproportionately affect poor and vulnerable communities. According to a major report released for World Bank this year, India will be threatened by a more erratic monsoon season, extreme floods, rising sea levels and very high temperatures due to climate change. As we have seen, preparing for these events not only mitigates the damage that befalls residents when disaster strikes, but also expedites the recovery for communities in the aftermath. Hurricane Sandy was a wake-up call in the U.S., helping spark Obama’s new federal approach to preparing for climate change. In addition to the top 10 post-Sandy priorities list created by NRDC, the United States and India can work together to coordinate and strengthen climate adaptation efforts at a national and local level. Earlier this summer, the immediate need for stronger community reliance was emphasized in India by the devastating flooding in the northern Indian states, where almost 6,000 people died. This year’s monsoon was also the longest in 70 years with flooding continuing into October. In response to extreme weather events that ravaged several northern Indian states, Prime Minister Singh recently announced a re-emphasis on disaster risk reduction strategies through the National Disaster Management Authority. While much more need to be done to prepare and protect communities, a few leading examples show how effective preparedness can be in saving lives. For example, last month, the warning and preparation done ahead of cyclone Phailin hitting India’s east coast in October was hailed as ‘effective’ by the United Nations. Coordinated efforts between the state governments of Odisha and Andhra Pradesh and disaster management crews evacuated almost 100,000 people from the threatened coastline within 24 hours. 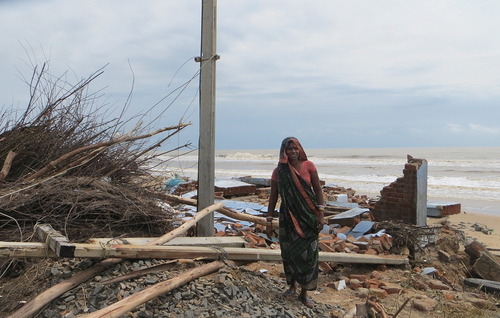 Approximately 21 people died as the cyclone made landfall, compared to almost 10,000 people when a similar cyclone hit the Odisha coast in 2009. Indian cities, like American cities, are also creating early warning systems to prepare for increasingly extreme weather on a local level. After hundreds of residents died when a heat wave hit the city of Ahmedabad in 2010, the local government partnered with NRDC, the Indian Institute of Public Health and a coalition of partners to prepare a heat action plan and early warning system for future heat events. The Ahmedabad heat action plan builds community awareness of the health dangers of heat waves, notifies agencies, the media and residents when a heat wave approaches and coordinates agency and hospital responses during and after heat waves. This heat action plan, the first adopted by a city in South Asia, was implemented ahead of the 2013 heat season. Replicable plans can be tailored and adopted across India to save lives based on the blueprint of this groundbreaking effort. Similarly, in the U.S., heat health preparations adopted in New York, Maryland and California offer adoptable models for other American cities vulnerable to extreme heat. Preparing for the worst impacts of climate change is a key component of any cohesive plan to combat global warming. Building resilient cities is necessary to protect people and help them recover as climate-related disasters worsen. The United States and India’s efforts to shore up their cities and populations are much-needed steps towards this goal.